This puzzle was inspired almost exactly five years ago, after I saw Peter A. Collins's OCTOPUS with eight ARMs. After several false starts, I returned to the idea at the end of 2013 to try to "weave a web" of theme in the middle, and found the CHARLOTTE / ARACHNIDA / SPINNERET combo after much trial and error (BITE MARKS came from the resulting ??T???R?? pattern). I submitted the puzzle in July 2014 using the phrase "this puzzle's theme creature" instead of "spider" in the theme clues, but I guess that wording may have been too hard for a Tuesday. I hope you enjoy solving this puzzle as much as I enjoyed constructing it! Neat first impression of those circled letters; they form such an interesting looking pattern. My very next thought was to worry what compromises those diagonal words might bring about — they're so hard to fill cleanly around. So I was really looking forward to seeing if the payoff was worth whatever crossword glue was necessary. 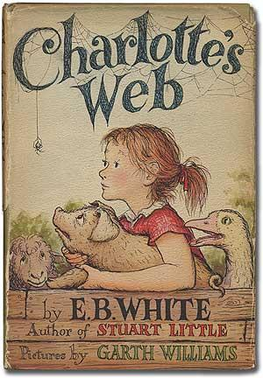 Fun to get some thematic material in CHARLOTTE of "Charlotte's Web," a SPINNERET, the class ARACHNIDA (though I would have preferred the more familiar ARACHNIDS). BITE MARKS felt much less specific, but as Alex mentioned, it is tough to find a fourth themer that interlocks CHARLOTTE and SPINNERET. Sure would have been nice to get another famous spider or something. Those four corner LEGs create such filling difficulty. NEVEU is particularly tough (French for nephew), but the KRESGE / EREBUS crossing was the place that gave me the most pause. Oof. Along with some of the usual EDA GELL OMOO ULM BELLI it sure felt like a lot of crossword glue. No doubt, placing those eight LEGs in such a fixed pattern makes for a very difficult filling challenge. I'd be interested to see what a few cheater squares would do to improve the final product — I wonder if a black square at the end of KRESGE and/or EREBUS would have allowed for a better result in the SE corner, for example. It would have been nice to get a more spider-like visual — sort of like the logo on Spider-man's chest — but still, an interesting grid image with three really nice interlocking theme answers. Answer summary: 2 unique to this puzzle, 4 unique to Shortz Era but used previously. There are 15 rows and 15 columns, with 24 circles, 0 rebus squares, and no cheater squares. The grid uses only 19 of 26 letters, missing FJQWXYZ. Average word length: 4.79, Scrabble score: 277, Scrabble average: 1.48.